25 November 2016, at 6:00a.m. 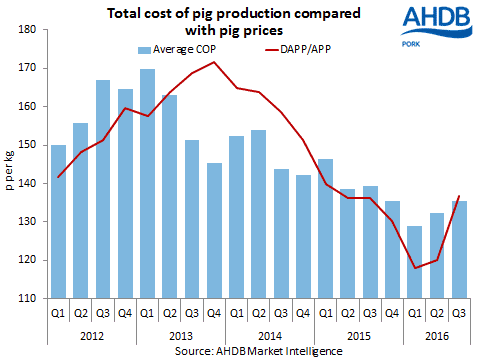 UK - Pig production costs in Great Britain rose again in the third quarter of 2016, to an average of 135p/kg, according to latest estimates from AHDB Pork. Despite this, a more rapid rise in pig prices meant that producer margins were positive for the first time since 2014. Based on the latest estimates, production costs were 3p higher than in the previous three months, although they were still lower than the same point last year. However, a 17p rise in the average pig price during the quarter was sufficient to turn a £10 per pig loss during the second quarter into a small profit. As is usually the case, feed prices were the main driver of the increased production costs in the latest quarter. There were also modest improvements in feed efficiency, which contributed to the lower costs. However, herd productivity was little changed, while somewhat higher post-weaning mortality rates will have added to costs. Although feed prices have continued to rise since September, partly due to the weak pound, pig prices have increased steadily too, so producer margins are likely to have improved further. While this may be insufficient to lead to any significant expansion of the breeding herd, it should at least have ensured that sow numbers have stabilised. This adds weight to expectations that pig supplies may return to growth as we progress through 2017.